Direct beachfront fully equipped 2 bedrooms & 2 bathrooms condo that has 2 levels. The ground floor living and kitchen area open up to the own private patio. The pool is steps away. The second floor master bedroom opens up to a large private patio with amazing ocean view and a great place to watch the sunset. 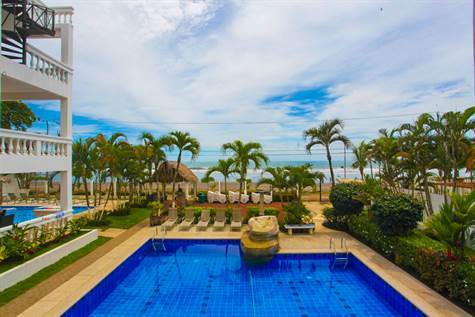 La Paloma Blanca is a beachfront condominium complex that offers luxury, tranquility and relaxation.There are four swimming pools on site, one extremely large free form lap pool with cascading waterfalls, as well as a kid’s pool beside it. There are also two beachfront pools, which are smaller and more private. All pools include lounge chairs There is direct access to Jaco beach and can walk out from the pool and put your feet on the sand.